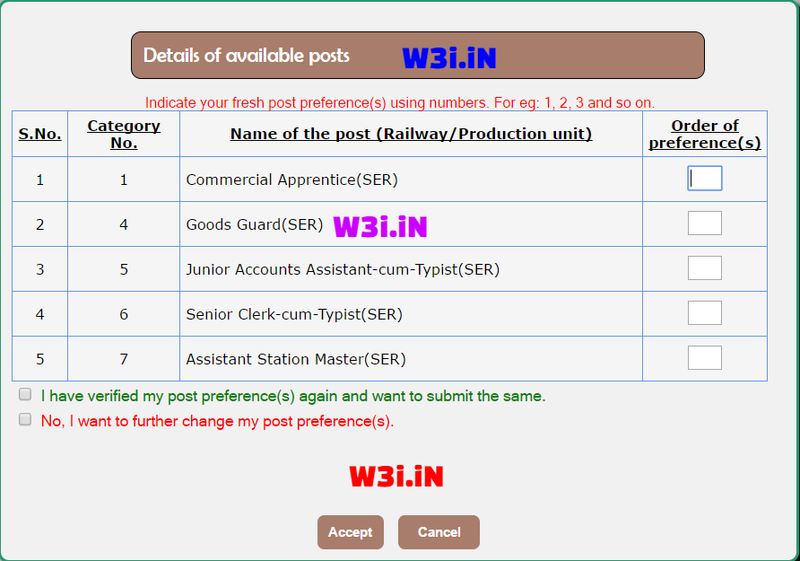 RRB CEN 03/2015: Change/ Fill Fresh Post Preferences in Railway NTPC at rrbonlinereg.com. Looking for RRB NTPC Post Preference List? Here is how to Change Post Preferences in Railway Recruitment 2017. As we all know that Link to Change RRB NTPC Post Preference will be started on 8th May and it will close on May 14th. Many of you have not issue with your pre-filled Railway NTPC Graduate Post Preference and many of you will change your RRB NTPC Post Preference order again before the last date. Update: We have shared the best preference list based on salary, work and job satisfaction and preference list for female candidates as well. Before announcing RRB NTPC Result, RRBs have invited candidates to change their Post preference for the NTPC Posts again. A large vacancies are up for grabs, it is one of the largest recruitment process by a government organization. Thus many of them are still confused in regard to fill the preference list. Many candidates have confusion on which Post they should put on first preference for Railway NTPC Recruitment. Based on the RRB NTPC Revised Vacancy list, candidates are advised to fill fresh preference for NTPC Graduate category posts against CEN 03/2015. Dear confused candidates, here we have solution for all your questions or confusion. In the post below we are providing the Respective Preference list of Railway Graduate Category Posts which is based on the complete analysis of RRB NTPC Job Profile, Salary, Grade pay, Career growth and other details. Here is How to Fill Post Preferences in RRB CEN 03/2015 recruitment. As you know, Railway has once again invited candidates to fill fresh post preference for NTPC posts. 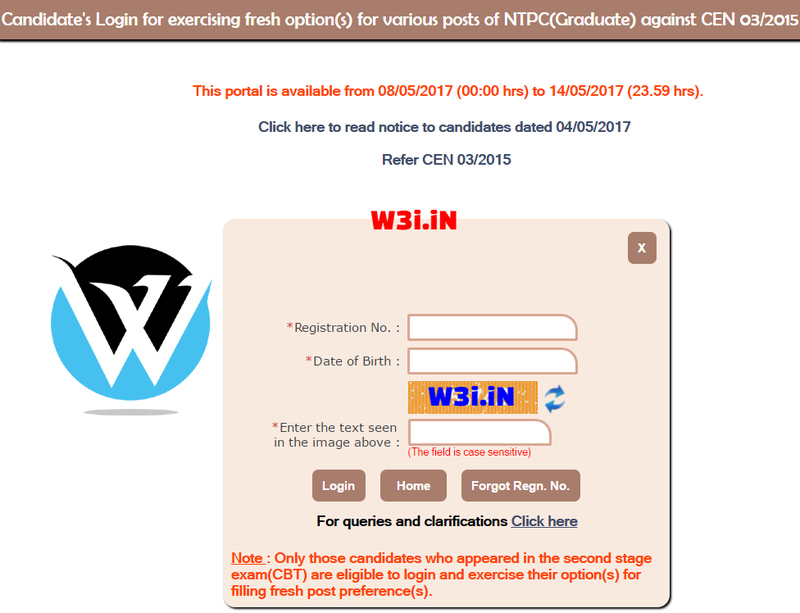 In order to change RRB NTPC Post Preference candidates have to fill this form. 1st Stage Exam qualified candidates are required to fill post preference for the 9 posts that come under RRB NTPC Graduate Category (CEN 03/2015) Recruitment drive. So if you want to fill appropriate order of post preference, this post is going to help you in taking a decision. RRB NTPC Revised Vacancy list in Indian railway against RRB CEN 03/2015 are open for both Male and Female candidates. But there are post that may not suit all Girls/ Women candidates. So we have analysed the post preference order for both Male and Female candidates. Have a look at RRB Preference List for Railway NTPC CEN 03/2015. Here is a quick guide to change RRB NTPC Post preference order. A step by step instructions to fill fresh post preference for RRB NTPC 03/2015 recruitment. Before start filling RRB NTPC Post preference have a look at faqs on RRB NTPC Post preference. RRB NTPC Post Preference FAQ. Visit the official website at rrbonlinereg.in[Click here]. The page will be looks like this. Select Your RRBs and click on Apply button. A new page will be open where you need to enter your Registration No. and D.O.B. This page will look like this. Check out the below picture. A new page will be open with your Post preference details. This will look like this. Check the picture below. Download RRB NTPC Revised Vacancy. Check your pre-filled RRB NTPC Post preference. Now click on Set Preference Link. This page will look like this. Check picture below. Fill the appropriate Post Preference. Now, Click on Accept button. A message will be shown, saying you have changed your Post preference for the post of NTPC against CEN 03/2015. Cheers! You've changed your Post Preference. Note: Candidates can change their post preference only once. Keep this in mind. 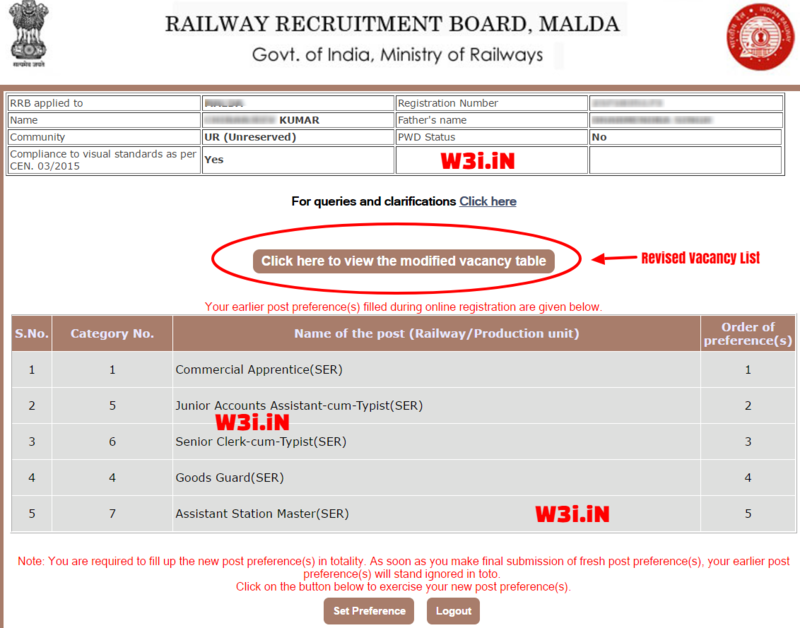 Have a look at all the 9 posts to be filled through this Railway recruitment. Since this RRB recruitment has been conducted in first and second stage computer based exam, there are no interview in Railway NTPC selection process. Here candidates are to be chosen based on their online exam marks and other qualify test (Typing Skill Test, Psycho test) scores only. We can easily guess there will be a fixed cutoff by each Railway Board (RRBs) depending on their total vacancies. While filling the fresh post preference option for Railway Recruitment 2017, candidates must know the qualifying tests (Psycho & Typing Test) & medical standard that are required for those posts. While giving Asst Station Master and Traffic Apprentice top preference candidates must be aware about eyesight. At the same time for Senior Clerk Typist, ECRC and Junior Account Asst posts candidates have to be ready for Typing tests. Candidates also must know the most stressed but high paying job profile of Goods Guard.